Do you decorate for Valentines Day? I'm trying to decide if I'm going to or not. We live in a small log cabin and I've been looking for rustic ways to add a touch of LOVE for the holiday. Here's a rustic Valentine banner that I created from scraps. 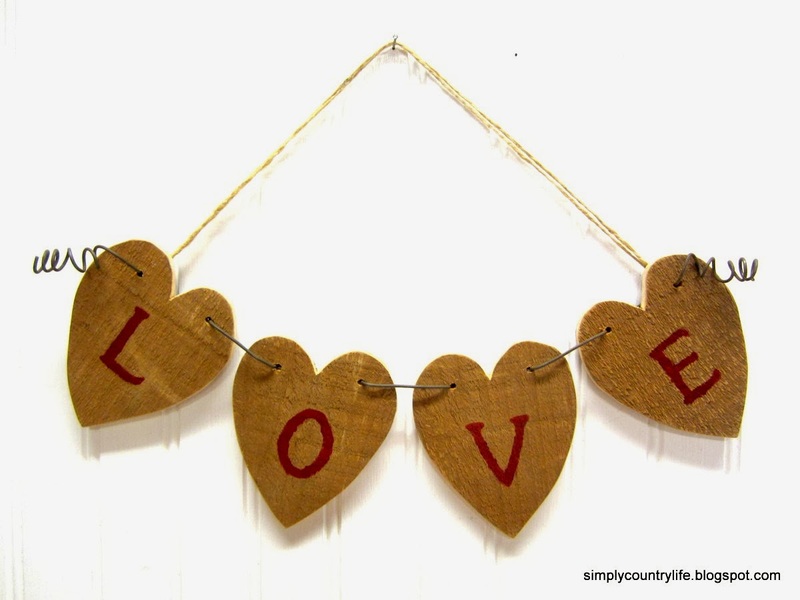 The wood hearts are cut from a piece of a vintage fruit crate. This crate wasn't in good condition at all, but it did have great wood pieces. Here is another project I made using the other pieces of the crate. This project was quite simple. I traced a heart pattern onto the wood 4 times. Then cut out each of the hearts and drilled two holes into each one. The ends of the wire were wrapped around a pencil to curl them. Then the letters LOVE were painted on the hearts using a stencil. I did add a piece of twine to hang it with. That's it. I told you it was pretty simple. What do your Valentines decorations consist of? Do you go all out or just a little here and there? pops of red hearts for our cabin. Very cute! I don't usually decorate for Valentines Day. That is my wedding anniversary and we tend to focus a bit more on that (I think) than it being Valentines Day. We will celebrate 21 years next month. I'm so glad you've stopped by. I grew up in Sanford/Apopka area until high school and then my family moved to Jupiter, where I lived across the street from the beach until I was 33. The country life has been different and very challenging at times. It's a lot of work and the solitude got to me in the beginning, however, I love the peace and quiet now. One of my dearest friends attended Southeastern. I'm a little bit familiar with Lakeland. Happy Anniversary! 21 years - that's great. We're coming up on 7 years this June. We've had quite the ride, gutting a mobile home and redoing it to live in while we built our cabin, building his workshop (he builds guitars and mandolins, www.junemandolinsandguitars.com), building 2 outbuildings (sheds) building my workshop, building a pole barn with a guest apartment in it (currently working on completing this) and trying our hand at gardening the last 4 years, all while maintaining 15 acres of pasture/hay field (no animals though). It has been quite the change from lounging in the sun. I hope you stop by often and say hello.